You've seen the Amish people, an Old World religious order that transplanted to the United States and Canada hundreds of years ago. You've seen them in Pennsylvania and scattered throughout the Midwest. You've see the men with their chin beards and black hats and the women with their long dark dresses and white bonnets. You've see them with their horses, buggies and manual tools with which they plow the land as their ancestors did. What you probably haven't seen is their family breakfast: pancakes with butter, fried potatoes, eggs and sausage. Or their lunch: ground beef, cheese, beans and lots of bread. Don't forget their dinner: more beef, this time dripping in gravy, more potatoes, more bread, more butter. And, of course, their dessert: pie with thick, gooey ice cream. The other thing you don’t see among the Amish? Obesity and diabetes. The Amish break just about every diet "rule" known to modern nutrition, and yet their rate of obesity is a meager 4 percent, compared to 31 percent obesity in the adult population of the United States. Their cancer rates are 72 percent lower than the rest of America. In one study, the prevalence of diabetes was half what it was in the non-Amish Caucasian population. Now, in fairness, the Amish do seem to experience levels of heart disease commensurate with the rest of us, and it is unclear if this has something to do with a higher genetic predisposition to heart disease. The Amish also have vastly exaggerated health risks associated with horse-and-buggy accidents and manual threshing tools. Seriously, it's a problem. But those risks aside, what accounts for the Amish's superiority in the realms of obesity, diabetes and other prevalent American killers? How many steps do you take in a day? Read that again. Not how many miles do you run, or how many hours of yoga do you do, but how many steps do you take? If you take about 10,000 steps a day, you are considered by some medical authorities to have a "very active lifestyle." In a study conducted by David R. Bassett, Ph.D, FACSM, an exercise researcher at the University of Tennessee, an Amish population wore pedometers to measure their steps.1 Dr. Bassett found that Amish men took an average of more than 18,000 steps and Amish women took an average of more than 14,000 steps per day. Considering a few other aspects of physical activity, the Amish were about 6 times as physically active as non-Amish populations. The benefit of all this walking with respect to obesity and diabetes is profound. "Eat What Your Great-Grandparents Ate"
The landmark studies on the Amish—as well as a plethora of other recent studies on nutrition—have led many nutritionists and medical experts to rethink several decades of dietary "wisdom." While no one questions the role of lifestyle and, yes, diet in obesity and diabetes, just what that diet should be has become a question. Although they may be lower in saturated fats and calories, are industry-produced, synthetic foods, such as bacon-flavored soy and protein bars better than, say, a piece of bacon, a strip of beef jerky or a handful of nuts? No one really knows, but evidence is beginning to mount in favor of natural, whole, unprocessed foods whenever possible. The Other Side: Too Little Saturated Fat? 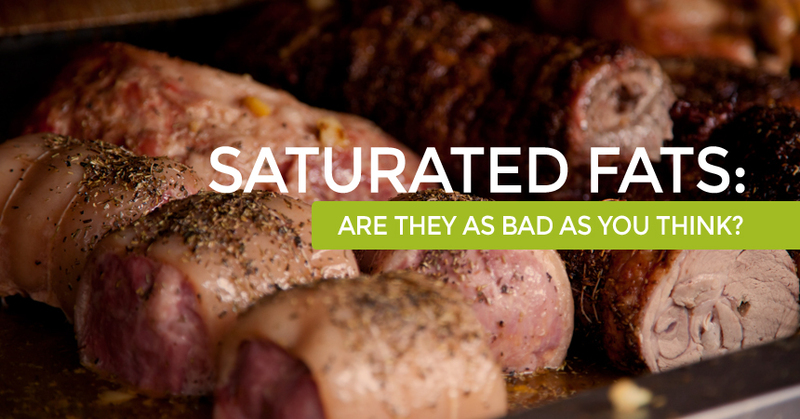 So, as we rethink the question of saturated fat, we must ask: Is there such a thing as too little saturated fat? The answer is tricky. There is definitely such a thing as too little fat because fat contains properties essential to the movement of cholesterol through the bloodstream, but not all fat is the same. The best fat, according to current medical thinking, is polyunsaturated fats, which are found in walnuts, quite a few seeds and fish, to name a few. But some of the essential nutrients in polyunsaturated fats are found in saturated fats, too, and there is the question of availability, cost and the enjoyment of life. That big plate of roast beast and mashed potatoes mentioned above? When you get sick of salmon and walnuts, current medical thinking says you shouldn't fret too much about that good old-fashioned Amish meal—but only if you're getting your good old-fashioned Amish exercise! For heart health, get a long frock, a horse and buggy and maybe a scythe. Just kidding. But relax a little about the non-fat versus low-carb diet fads that seem to change every week. Eat what your great-grandparents ate—and walk as your great-grandparents walked. You know the little tricks: Park at the furthest point from the entrance to the store. Take 20-minute walks a couple times a day. Spend 30 minutes walking on the treadmill. And when you’re walking like you should, and you notice a pleasant spike in your hunger, realize that "indulgent" meal was eaten by your great-grandmother for a reason, and a very good reason at that. Bassett DR. Physical activity in an old-order Amish community. Med Sci Sports Exerc. 2004 Jan;36(1):79-85. Siri-Tarino PW, Sun Q, Hu FB, Krauss RM. Meta-analysis of prospective cohort studies evaluating the association of saturated fat with cardiovascular disease. Am J Clin Nutr. 2010;91:535-46.